David Sugden was the driving force behind the successful design of mechanical full-face rock excavation machinery over a number of years, resulting in the forging of countless tunnels across the world. David continually showed a commitment to innovation and design throughout his career, often custom making machinery to solve problems that arose and for which no existing devices were available or appropriate. As a result of this attitude, David is listed as the inventor on over 40 patents. Beginning his career in 1938 as a Cadet Engineer with the Public Works Dept of WA he continued with a number of appointments at the Hydro-Electric Commission of Tasmania. Whilst at the HEC, David was instrumental in introducing the Commission and subsequently Australia to Machine tunnelling. In 1967, David began a long and internationally recognised consultancy career that continues to this day. Notably he had significant involvement with both the Robbins Company of Seattle, USA and Terratec Asia Pacific. David was actively involved in an honorary capacity on various community organisation boards, CSIRO committees, various educational and professional committees and the Industrial Design Council of Australia. Not restricted to designing tunnelling equipment, David designed a new violin, which is cheaper to produce but still maintains a quality sound, opening up the learning of the violin to a greater number of people and which has been favourably received by the conservative music world. David was been recognised for his contribution to tunnelling and the mentoring of young engineers involved in the field, with the Allen Neyland Tunnelling Achievement Award in 1996, an Order of Australia in 2002, and the 2003 A.G.M. Michell Award for his outstanding contribution to Australian Mechanical Engineering. 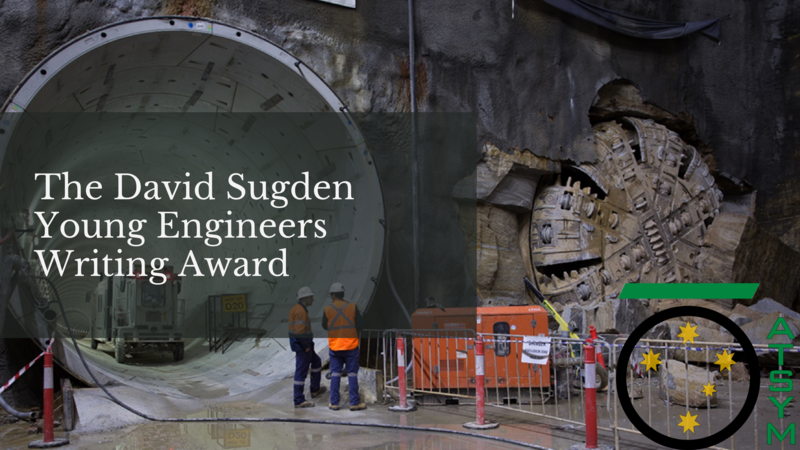 In 2004 the Australian Tunnelling Society started the David Sugden Award to encourage young engineers to develop the art of technical writing. The competition is open to all ATS members and university students under 35 years of age (as at 31 August 2019). Best paper to be judged by the Australian Tunnelling Society Executive Committee.